There was an incident some years ago at songwriter Benj Pasek’s Pennsylvania high school. What happened left such an indelible impression on the student that years later it would become the basis of a Tony award-winning Broadway musical he would write, with music and lyrics by Pasek and his writing partner Justin Paul, and a book by Steven Levenson. 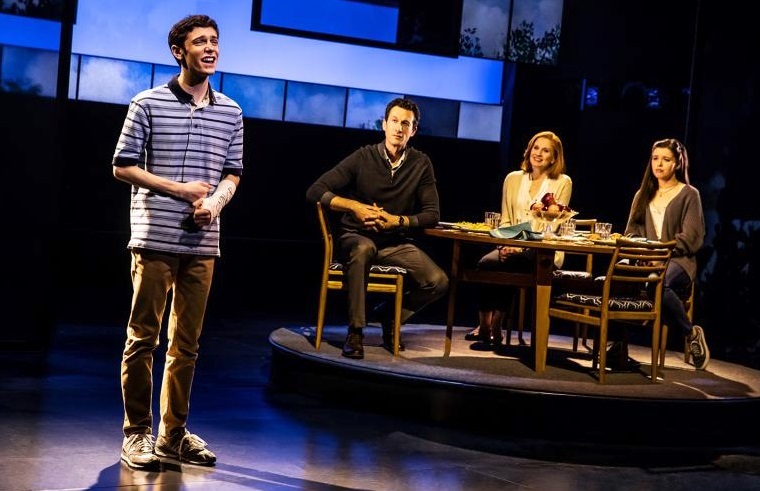 In the first national touring production of the stage musical Dear Evan Hansen, Ben Levi Ross, who made his Broadway debut just last year when he joined the cast of the show in New York, plays the lead, Evan Hansen. Evan is a high school senior with severe social anxiety. His father left the family years earlier. Now the boy lives with his mother, Heidi (Jessica Phillips) who works during the day as a nurse’s aide and spends her evenings at paralegal school. As a result, Evan is on his own. A lot. 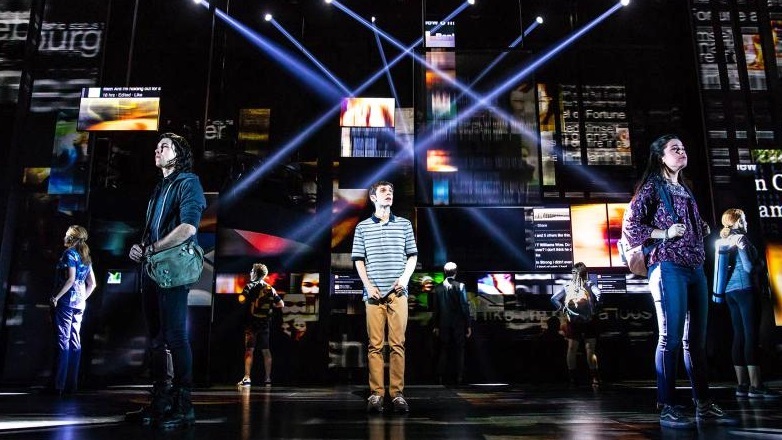 Played against a backdrop of scenic designer David Korins’ stunningly complex computer images projecting glimpses of Instagram, email accounts, and YouTube videos, it’s as if characters are constantly navigating their way through a labyrinth of social media outlets wherever they walk. When Evan writes his daily letters you catch glimpses of his typewritten therapy all around him. At the same time, while the musical focuses on Evan and the severity of his awkwardness, there’s another family across town that will soon be getting equal attention. They’re the wealthier Murphy family whose high school senior son, the moody, nihilistic, pot smoking Connor (Marrick Smith) whose hair is described by snarky Jared as “Very school-shooter chic” has no interest in anything or anyone. That incident that’s going to change everything is about to happen. While at school, after signing Evan’s cast and telling him, “Now we can both pretend we have friends,” Connor snatches a copy of one of the boy’s therapeutic letters, the one that reads ‘I wish that anything I said mattered’ and kept it. Days later, Connor commits suicide. 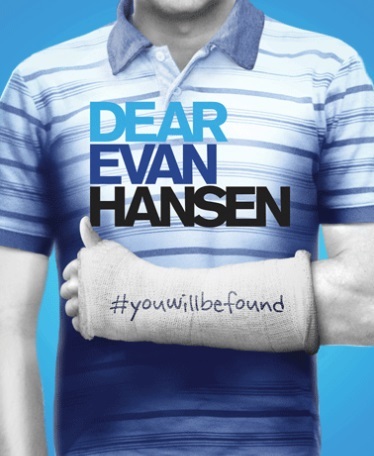 When his pockets are searched, all the grief-stricken family can find is the letter that begins Dear Evan Hansen. What begins as the best of intentions quickly spirals out of control. Because of the letter, Connor’s parents and his young sister Zoe (Maggie McKenna) are lead to believe that Evan was Conner’s best friend and that he had poured his heart out to him. Connor even signed the boy’s cast when no one else would. They had to be friends. Rather than deflate their impression that Connor was really a loner that no one liked, Evan stumbles through lie after lie about a relationship that never was. 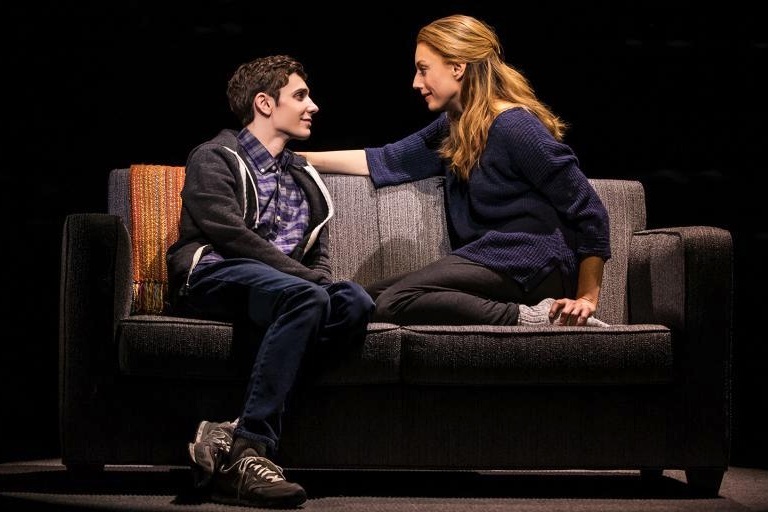 Suddenly, Evan Hansen, the boy too awkward to make friends is now playing not only an important role at school but in both the Murphy family’s life and on social media. This national touring production directed by Michael Greif has only recently debuted its run, beginning last month in Denver. The current lineup in performance at ASU Gammage in Tempe until Sunday, Dec 2 remains the original touring cast, and they’re simply sensational, all eight of them, including Phoenix raised Phoebe Koyabe back on home turf in the valley as Alana Beck, Evan’s classmate who is constantly on the lookout for any opportunity to boost her academic credits. As the title character, twenty-year-old Ben Levi Ross is quite remarkable in a high-energy role; one of surprising physicality. In addition to his stumbling, mile-a-minute dialog that usually ends with saying “sorry” repeatedly, his body language, full of never-ending tics where his hands tug on his shirt, and his head jerks sharply from side to side, are as carefully choreographed as any dance move. When he rambles apologetically or simply tries to communicate, he appears in constant danger of doing some personal internal harm; something might snap at any moment. On this tour, the demanding role will be played by Stephen Christoper Anthony on both the Saturday matinee and the Sunday evening performances. Special mention also to Maggie McKenna who became an overnight star in her native Australia when she made her professional debut as Muriel in the musical version of Muriel’s Wedding, based on the hit 1995 movie. McKenna plays Zoe, Connor’s younger sister and Evan’s secret longtime schoolboy crush. The role, while crucial, is not on stage enough, leading this reviewer to ponder whether the desire to see the rounded character at more intervals is due to the writer’s creation or in McKenna’s appealing interpretation. I’m suspecting both. Plus there’s not a hint of her native Aussie in her pitch-perfect American accent. The songwriting team of Pasek and Paul, who scored high with their recent original movie soundtrack of The Greatest Showman and before that the Oscar favorite La La Land, has again created a series of memorably infectious songs that garnered a Best Original Score Tony last year and a Grammy for the original cast recording. Your attention is immediately grabbed with the musical’s opener Anybody Have a Map as Evan’s mother Heidi and Conner’s mother Cynthia (Christiane Noll) ask themselves how to connect with their sons. The first act closer, You Will Be Found sung by the ensemble, is so emotionally wrenching, don’t be surprised if you notice audience members around you wiping a tear as the house lights fade up. 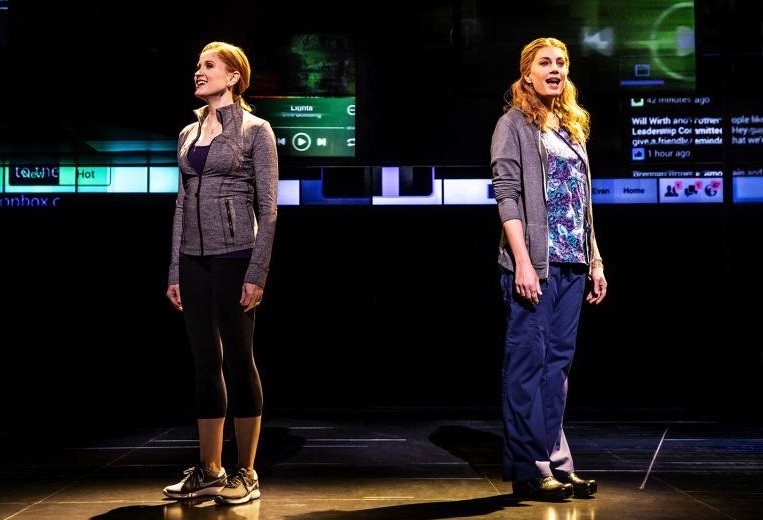 Dear Evan Hansen is extraordinary musical theatre.